This article is about the food ingredient. For shortened forms of words, see Clipping (morphology). Shortening is any fat that is a solid at room temperature and used to make crumbly pastry and other food products. Shortening is used in pastries that should not be elastic, such as cake. Although butter is solid at room temperature and is frequently used in making pastry, the term "shortening" seldom refers to butter, but is more closely related to margarine. Originally shortening was synonymous with lard, but with the invention of margarine by French chemist Hippolyte Mège-Mouriès in 1869, margarine also came to be included in the term. Since the invention of hydrogenated vegetable oil in the early 20th century, "shortening" has come almost exclusively to mean hydrogenated vegetable oil. Vegetable shortening shares many properties with lard: Both are semi-solid fats with a higher smoke point than butter and margarine. They contain less water and are thus less prone to splattering, making them safer for frying. Lard and shortening have a higher fat content compared to about 80% for butter and margarine. 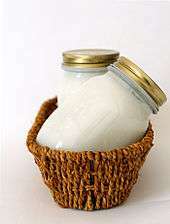 Cake margarines and shortenings tend to contain a few percent of monoglycerides whereas margarines typically have less. Such "high ratio shortenings" blend better with hydrophilic ingredients such as starches and sugar. Hydrogenation of organic substances was first developed by the French chemist Paul Sabatier in 1897, and in 1901 the German chemist Wilhelm Normann developed the hydrogenation of fats, which he patented in 1902. In 1907, a German chemist, Edwin Cuno Kayser, moved to Cincinnati, Ohio, the home town of soap manufacturer Procter & Gamble. He had worked for British soap manufacturer Joseph Crosfield and Sons and was well acquainted with Normann's process, as Crosfield and Sons owned the British rights to Normann's patent. Soon after arrival, Kayser made a business deal with Procter & Gamble, and presented the company with two processes to hydrogenate cottonseed oil, with the intent of creating a raw material for soap. Since the product looked like lard, Procter & Gamble instead began selling it as a vegetable fat for cooking purposes in June 1911, calling it "Crisco", a modification of the phrase "crystallized cottonseed oil". A triglyceride molecule, the main constituent of shortening. 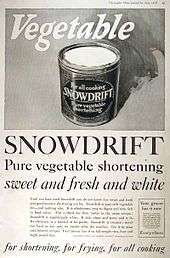 While similar to lard, vegetable shortening was much cheaper to produce. Shortening also required no refrigeration, which further lowered its costs and increased its appeal in a time when refrigerators were rare. With these advantages, plus an intensive advertisement campaign by Procter & Gamble, Crisco quickly gained popularity in American households. As food production became increasingly industrialized and manufacturers sought low-cost raw materials, the use of vegetable shortening also became common in the food industry. In addition, vast US government-financed surpluses of cottonseed oil, corn oil, and soy beans also helped create a market in low-cost vegetable shortening. Crisco, owned by The J.M. Smucker Company since 2002, remains the best-known brand of shortening in the US, nowadays consisting of a blend of partially and fully hydrogenated soybean and palm oils. In Ireland and the UK, Cookeen is a popular brand, while in Australia, Copha is popular, although made primarily from coconut oil. A short dough is one that is crumbly or mealy. The opposite of a short dough is a "long" dough or dough that stretches. Vegetable shortening (or butter, or other solid fats) can produce both types of dough; the difference is in technique. To produce a short dough, which is commonly used for tarts, the shortening is cut into the flour with a pastry blender, pair of table knives, fingers, or other utensil until the resulting mixture has a fine, cornmeal-like texture. For a long dough, the shortening is cut in only until the pea-sized crumbs are formed, or even larger lumps may be included. After cutting in the fat, the liquid (if any) is added and the dough is shaped for baking. Neither short dough nor long flake dough are considered to be either creamed or stirred batters. In the early 21st century, vegetable shortening became the subject of some health concerns due to its traditional formulation from partially hydrogenated vegetable oils that contain trans-fatty acids, or "trans fats", as these have been linked to a number of adverse health effects. Consequently, a low trans fat variant of Crisco was introduced in 2004. In January 2007, all Crisco products were reformulated to contain less than one gram of trans fat per serving, and the separately marketed trans-fat free version introduced in 2004 was consequently discontinued. In 2006, Cookeen was also reformulated to remove trans fats. 1 2 3 4 5 Jackson & List (2007). "Giants of the Past: The Battle Over Hydrogenation (1903-1920)", Inform 18. ↑ "Products - Shortening - All-Vegetable Shortening - Crisco - Crisco". Crisco.com. 2010-09-30. Retrieved 2011-12-05. ↑ "Frequently Asked Questions: I can't find the Crisco green can anywhere". Crisco.com. Archived from the original on Feb 18, 2008. Look up shortening in Wiktionary, the free dictionary. William Shurtleff and Akiko Aoyagi, 2007. History of Soy Oil Shortening: A Special Report on The History of Soy Oil, Soybean Meal, & Modern Soy Protein Products, from the unpublished manuscript, History of Soybeans and Soy foods: 1100 B.C. to the 1980s. Lafayette, CA (US): Soyinfo Center.